Installing a new roof shouldn't be challenging. Your roof makes up a majority of your home's exterior and lends itself heavily to the design and composition. The roof, much like other external elements of the house needs to serve two purposes: function and design. What most homeowners don't realize is the flexibility and choices they have by choosing to install a metal roofing system. At StealthBond®, we want to make it easier to get a metal roof that not only outperforms other options on the market but offers a level of sophistication. It's important for homeowners to feel their new roofing system not only withstands harsh elements but compliments the design and improves curb appeal. With the StealthBond® System you can achieve a balance of functionality and a modern look unlike anything else on the market. StealthConnector®: The metal stripping is attached to the decking using ring shank nails. The StealthBond® Adhesive is applied to the StealthConnector® in the center to the length of the panel. StealthBond® Adhesive: is a 2- part epoxy that replaces the need for thru fasteners like screws. It secures the metal roofing panels in place. 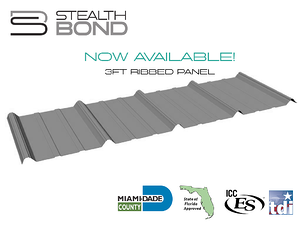 StealthBond® Metal Roofing: Metal roofing panels are available in a variety of styles and colors. Wow, they are gluing down roofs now? Does this even work? How would I know? Why does it matter how it is installed? We want homeowners interested in StealthBond® to understand that our system was developed out of many homeowners wanting a solution to fastener failure and contractors wanting to give their customers the look they want ( 5V Crimp Panel without the screws) for their home. Our adhesive installation answers a huge problem with metal roofing installation AND we have completed all the testing and approvals needed to give you peace of mind when choosing StealthBond®. You have a choice in your roofing installation system that goes beyond color and profile preference. Choose the system you can rely on. Choose StealthBond®. 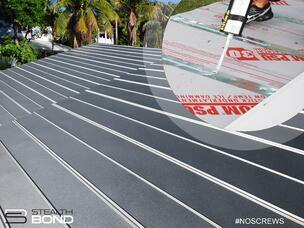 Learn more about the StealthBond® Metal Roofing by visiting our website.